Saturday’s Set Points, WTA Indian Wells, Day 4: Venus & Lucie fight back, Madison returns! Angelique Kerber won her first match at Indian Wells since 2013, halting a four match losing streak in the desert with a routine straight sets win over Andrea Petkovic, 6-2 6-1 in just 58 minutes. It wasn’t a classic by any means but Kerber delivered a solid display with Petkovic committing many unforced errors, 24 to be exact. Kerber saved four break points and didn’t drop serve once. As to be expected, there was a nice embrace at the net!
. @AngeliqueKerber advances to @BNPParibasOpen Third round! Caroline Wozniacki won the last seven games of her opening match in Indian Wells, beating Magda Linette, 6-3 6-0. It was as you’d expect from Wozniacki as Linette committed too many loose errors to make this one competitive. It's a Woz-derful day! 💪 @CaroWozniacki def. Linette 6-3 6-0. Suarez Navarro or Siniakova next. Katerina Siniakova scored her best win since Shenzhen, beating the returning-from-injury and number 23 seed, Carla Suárez Navarro, 6-3 7-5. Siniakova got very shaky at the end but managed to compose herself to serve out the win at the second time of asking, converting on her fifth match point in a mad moonball rally. Up to 6-3 *4-3, it had been a very clean display from Siniakova who served well and was clutch on the big points. Katerina Siniakova all fired up and such. Naomi Osaka produced some awesome hitting, overwhelming Zhang Shuai, 6-4 6-2. Osaka served better and also produced some blistering pace, notably off the forehand wing. There were errors long, but on the whole, it was a decent display. Naomi Osaka in the tennis. Welcome back, Madison Keys! I’m so happy to see Madison back on the tour. For a set and a half and up 6-1 5-1*, she looked in cruise control against Mariana Duque-Mariño. However, the nerves creeped in at the end and MDM became a different player. Keys eventually sealed the win on her eight match point with a passing shot winner, 6-1 7-5. Here’s Madison being interviewed for Tennis Channel after her match. Keys will play Osaka in a third round rematch from last year’s US Open… BRING. IT. ON. 8 is my lucky number, too, Madison. Before bed, I caught the first set of Ana Konjuh against Peng Shuai which was goood. Peng Shuai came back from 2-4 down in the first set to win four straight games and then rather cruised through the second set. This was Peng Shuai’s 12th singles win of 2017 and she’ll get a shot at Agnieszka Radwanska in the third round. Julia Goerges won her fifth match in six encounters against Sam Stosur with a come-from-behind victory, 4-6 6-4 6-4. It was the fifth match in a row between Stosur and Goerges that had gone three sets. Simona Halep got off to a winning start with a 6-4 6-1 triumph over Donna Vekic. Simona had received some sad news earlier in the day. Venus Williams saved three match points with a tremendous fightback from 1-6 1-4 down, eventually seeing off Jelena Jankovic, 1-6 7-6(5) 6-1. Venus and JJ are now level at 7-7 in their head-to-head. Elena Vesnina recorded a first ever win over Shelby Rogers, 6-4 7-5 in one hour and 40 minutes. I woke up for the last hour of the final match of the day where Lucie Safarova beat CoCo Vandeweghe in a high-quality contest, 4-6 6-4 6-1. Lucie was not looking particularly secure on her groundstrokes or getting much of a read on return during the second set, but she was battling hard and hung in contention. She fought through three successive deuce games on her serve and then made the breakthrough with a sensational forehand return winner on set point. Lucie produced a superb performance in the third set – peak Lucie and she even served out the match to love with an ace! This was a huge, huge win for Lucie, building on decent displays in Taipei City and Budapest where she reached the semi-finals and final respectively. Lucie sets up a fascinating third round match with Venus.
.@LucieSafarova makes 4-6, 6-4, 6-1 comeback win over Vandeweghe! Third round action will start on Sunday – here’s a preview for my match of the day featuring Elina Svitolina and Daria Gavrilova in their sixth encounter in just the last year. Another good one that I can’t call for toffee will see Barbora Strycova play Anastasia Pavlyuchenkova. An all-veteran match-up between Svetlana Kuznetsova and Roberta Vinci should be fun too. They are tied at 3-3 in their head-to-head with a different winner each time. Vinci won their last match in Zhuhai so… ? In all seriousness, I think this court suits Kuznetsova better. The WTA top eight in IW took on the juggling challenge during All-Access Hour earlier this week. Some *good* news about the WTA streaming platform… IS THIS REAL LIFE? My guess is that the WTA will want the new streaming platform in place for when Maria Sharapova returns in Stuttgart in April. It has been inexcusable to have not supported the tournaments so far in 2017, notably Indian Wells and likely Miami. I was starting to wonder though whether this streaming malarky would be sorted anytime soon because of the lack of announcements so i’m reallllllyyyyy glad to hear some positive news on this front. RT if you hope the tennis journos in IW will track down Steve Simon to press him for answers on WTA's streaming/TV problems. There was only four of us and we played four sets of doubles, constantly swapping partners, and I was on the winning team twice so not bad. My brother and I are getting so much better as a pair and we won the one set we played together. I see now how important practice is with doubles just to understand what your partner is doing! My summer club nights start up in just three weeks and i’m so excited about playing weekly again. Not much beats playing tennis on a summer evening. I always feel more positive about life after thwacking a ball for a few hours. I’ll keep you all updated with my progress as I keep trying to improve and by all means, please share your own experiences in the comments section. 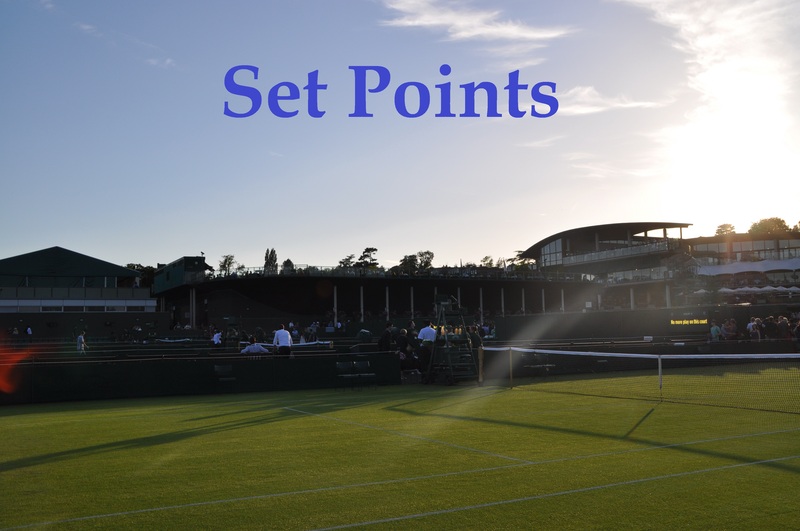 March 12, 2017 in Indian Wells, Set Points, WTA. The Domi Cib vs Kristy Plis match is at night (70f/21c) and should help the high energy Domi beat Kristy. Unfortunately, the Svit vs Dasha match is in the heat of the day (95f/35c) and could be a problem for one of the girls. Great joy in your girl Lucie beating CoCo. I think that should help Cibulkova although Kr.Plisk has played both her matches at night? I’d guess it could go against Svitolina considering she looked fatigued against Wang Qiang. Chuffed for Lucie, that third set was sensational! You don’t often see such positive stats like that in Indian Wells. Yes, great win by Lucie yesterday. I enjoyed the juggling challenge as well! They do some fun things in the All-Access Hour, Indian Wells is always a good one! Enjoyed the little Lauren Davis match on youtube. The little mighty mite made some Radwanska type shots against Sevastova. Davis just keeps on winning… I watched back Venus-JJ. Ouch so many opportunities for JJ and so nervous on the match points! I bet you’re pleased with how solid a year Safarova has had thus far. May even be the most consistent start to a year of her career actually. Yes, she was unlucky to draw Serena in the second round of the AO or she might even had made a deep run in Melbourne as well. Indeed! That third set from Lucie vs. CoCo was the best i’ve seen from her in singles in a long, long time. I think her scheduling has been smart, playing the Internationals since AO and getting the wins which is clearly rebuilding her confidence. I think she can go further this week but it would be foolish to write off Venus. The Cibulkova vs Pliskova match is not far off it being the best match of the season thus far. Incredible match and all, aswell as CoCo vs Lucie. Just a shame there wasn’t a big crowd for both matches as both are very late finishes. I noticed that during the day the smaller courts are packed with fans, because the fans are right on top of the action. Agreed, that was a fantastic ending! Really felt for Kr. Pliskova.